"WING, Benjamin, s[on]. Matthu of D[artmouth] and Content Tucker, d[aughter]. Abraham of D[artmouth], 18th, 8 mo., "called October," 1722, C.R.3""
Vital records of Dartmouth, Massachusetts, to the year 1850 ( Boston, Mass. : New England Historic Genealogical Society,1929-1930), Marriages, page 553, Benjamin Wing and Content Tucker entry, 1722. Benjamin Wing (1698-1782) was the son of Matthew and Elizabeth (Mott) (Ricketson) Wing of Dartmouth, Massachusetts. 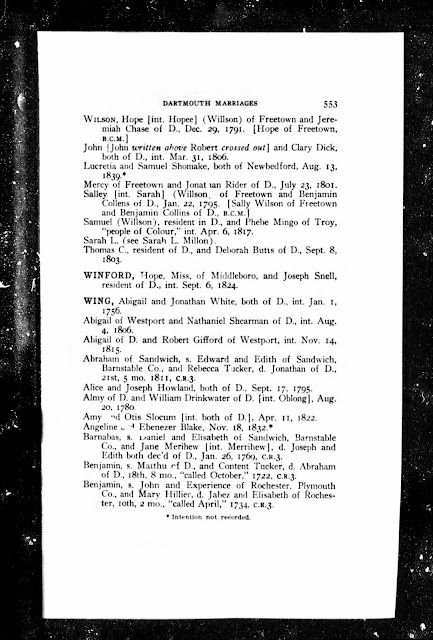 He married (1) Content Tucker (1695-1738) of Dartmouth, Mass., the daughter of Abraham and Hannah (Mott) Tucker, in 1722 in Dartmouth. This record for the marriage is a Derivative Source record, because it was copied from an earlier town and/or church record books. I did not find an earlier Dartmouth town record book in the Ancestry.com record collection. This record is from the church records of Society of Friends, Dartmouth Monthly Meeting (that is what "C.R.3" means according to the Dartmouth Vital Records book).